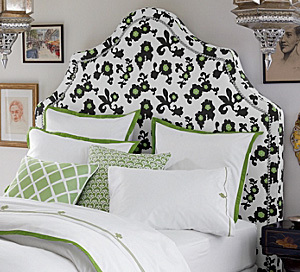 Upholstered headboards are a hot design trend for 2012. We’ve rounded up our favorite luxe-looking headboards that are big on style, but won’t break the bank. Upholstered headboards are becoming increasingly popular, and we’re starting to see a wide range of design looks, from Hollywood regency to tailored masculine. While ambitious DIYers may be inspired to make a headboard themselves, we’ve selected some affordable ready-to-order upholstered headboards that will add instant glam to any bedroom. 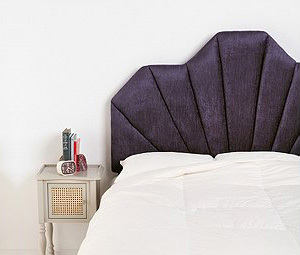 The art deco lines of the 1930s inspire the glamorous design in this headboard. The geometric curves add extra interest to the unique shape and are a refreshing departure from the popular tufting frequently found in upholstery. The crushed velvet fabric looks particularly rich and cozy in the plum shade. With metallic nailhead trim, this headboard speaks to the glamour and glitz of the Hollywood regency style. The closely tufted upholstery creates diamond patterns while the metallic detail brings a touch of sparkle, both of which add to the ritzy feel. 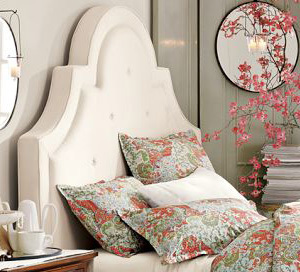 We think this headboard would look fabulous paired with a mirrored nightstand. 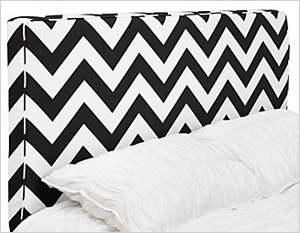 This graphic headboard from Z Gallerie comes in one of the season’s hottest prints — a classic black-and-white chevron pattern. 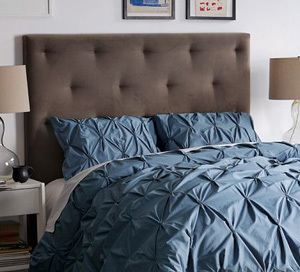 The playful zig-zag fabric will instantly liven up a boring bedroom. Keep the neutral palette going with black and white bedding or add a pop of color with trendy tangerine tango or the green. This Skyline Furniture arched headboard is a bargain at only $288! We think the inky black hue has a vixen glam appeal, but the design is available in lighter colors too. The soft foam padding makes for a cozy bedtime reading spot, while the shantung silk-like upholstery adds instant elegance. This cut-corner headboard from Ethan Allen comes with a variety of options, giving a customized look at an affordable price. Customizable options include diamond tufting or smooth front styling, choice of fabric, nailhead trim and accent welting. This basic headboard can be transformed into a sophisticated masculine or girly glamour look depending on the options selected. The high-arching curve on this fabric headboard is made even more dramatic with the inset border created by piping. We love the unique silhouette on this headboard because it adds playfulness to a classic, formal bedroom yet still looks great in an eclectic space with more funky accents and patterns. 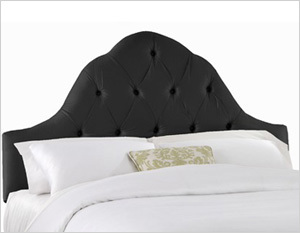 For those looking for a simpler headboard, check out this streamlined piece. The headboard is available in several color options, but the chocolate shade is a good choice for a bedroom that is equally balanced with both masculine and feminine traits. The classic rectangle shape grounds the bed, yet allows other showcase pieces to stand out. Our favorite splurge-worthy find comes from the design powerhouse Serena & Lily. 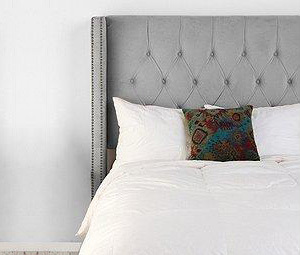 At 75 inches tall, this headboard is a great statement piece for the bedroom. Each headboard is made to order and includes a solid wood frame certified by the Sustainable Forestry Initiative. Playful patterns and solid prints are available, and you can customize the nailhead finish and leg color to create a super-chic look.